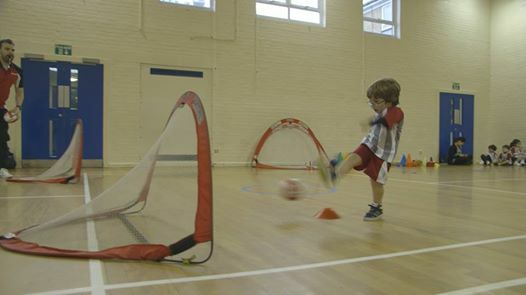 Every year, Little Kickers Ireland nominate a charity for our annual fundraiser. Over the past 3 years, we have chosen charities who look after sick children i.e. Crumlin Children’sHospital, Laura Lynn Hospice and The Jack and Jill Foundation and this has raised a whopping total of €25,000 for these charities! This year we have a chosen a charity that helps children who are in a different situation, children who are vulnerable and who require help and support. We are delighted to announce that Little Kickers chosen charity for 2015 is ISPCC Childline. Childline provides a 24 hour listening service for children, providing essential help when they are in desperate need of support and comfort. Last year alone they received nearly 500,000 calls. Critically, Childline receives only 10% government funding and the remaining 90% is funded by public donations. Due to decreased funding, Childline continually struggles to keep their 24 hour service open. In their 26 years of operation, Childline have found that their most serious calls from children are at night and if the late night service is reduced, they estimate that they would miss 45,000 calls and that they have already missed over 189,000 calls, due to lack of funding. (Full details at http://www.savechildline24.ie/). On the weekend of 18th/19th April, we will hold a nationwide fundraising event at all our classes - this event will be called "KICK FOR CHILDLINE". Here at Little Kickers we believe that there is no better way to raise money, than to have our Little Kickers fundraise for other less fortunate children who will benefit from essential support, help and comfort from Childline. The format for the fundraising is very simple: We will hold a special penalty shoot-out at all our classes on Saturday 18th/Sunday 19th. We give all parents/guardians a sponsorship card and we ask that they and their friends and/or relatives sponsor the Little Kicker for the penalties they score on the day. We are looking forward to a fun weekend for all our Little Kickers who will take part in this fantastic event! !